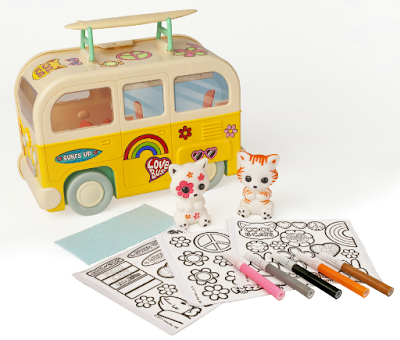 The Fuzzikins craft sets are a great gift for creative kids as they bring adorable fuzzy animals to colour and play with. These craft sets offer hours of fun customising the Fuzzikins and their world and when you're finished, you can wash them and you can colour them again with a new look. The Fuzzikins Campervan Carry Case (£19.99rrp) can be decorated and has plenty of space for the cats to enjoy a meal or have a quick cat-nap on the pull-down bed. Fuzzikins Cats love life on the open road and like nothing better than to drive their cool Campervan to the beach and party! All over South America would be my first choice but love the Lake District, too. I would love to go all around France in the spring/summer time. I would love to travel around Italy! I'd love to do Route 66. Definitely the Lake District with my husband and daughter. I'd be down in Cornwall at every opportunity. We would travel over to France and do a tour all over, I love the South. Up to the Scottish highlands! I’d love to travel around Europe and photograph the campervan in front of all the famous landmarks! I'd do a round Britain trip and visit some of the towns and villages my ancestors came from. I would travel all through Scotland! I'd love to go bird watching in Costa Rica, although I don't think a campervan would be practical for this. I'd love to travel to Ireland! I would love to go to Hawaii, it seems like such a beautiful place, with an amazing culture, people, food, eco system and traditions, I would like to experience an action packed day there with everything the island has to offer, finishing off with a bonfire at the beach! We would travel to Blackpool and stay by the sea! i'd explore more of cornwall or norfolk. I would travel through wales and see some beautiful sights! It would have to be around Cornwall and Devon that would be amazing. Up into the highlands, stopping at a loch or two! I would travel across Europe to tour Italy. The Highlands of Scotland, Cornwall, everywhere! I have been to the Lake District once and loved it so touring with a camper would be perfect. I would love to explore cornwall. I haven't been since I was little. I would love to go to the Scottish Highlands as we've not been before and it looks beautiful in pictures. I'd take my daughter and grandchildren to Cornwall. I would travel to mid Wales if I had a campervan. Arr there are so many places! I'd love a roadtrip around Canada and America to begin! I'd love to travel around the Lake District! We'd have to go to Europe! I'd love to go up to Cumbria - beautiful scenery there. I would love to travel the whole coastline of Britain. I would travel to Scotland! If I could pick up the campervan in China...then there! I'd love to hire one of those huge campers and go on a road-trip to America. Can't drive so would need a chauffeur as well as the money before I set off lol. All over the Highlands and Islands of Scotland! I would like to see anywhere & everywhere! So many places so little time! Heli L - Jurassic Coast. I'm sure the kids would love to have a go at trying to find some fossils.